​The ​Patriots​ took down the ​Rams in the ​lowest-scoring Super Bowl in NFL history. They sealed the win by sending Stephen Gostkowski out to knock in a 41-yard field goal attempt, putting the team up by 10 points with just over one minute remaining in the game. ​Bill Belichick may have been considering going for it on the fourth-down play, but ​Tom Brady convinced him otherwise. Belichick seemed unconvinced over the idea of kicking a field goal, but with scarcely over a minute remaining on the clock, it was the best option. ​Brady managed to convince his head coach of that, and Gostkowski delivered by driving home the 41-yarder. Brady can be heard telling Belichick, "we'll kick the field goal, 40-yarder, game's over." Brady's suggestion clearly worked as moments later the team was celebrating their 10-point lead and were sitting in pole position as time winded down and the Rams were without timeouts. Brady and Belichick have a strong relationship and clearly trust one another. How else would the duo have won six Super Bowls? 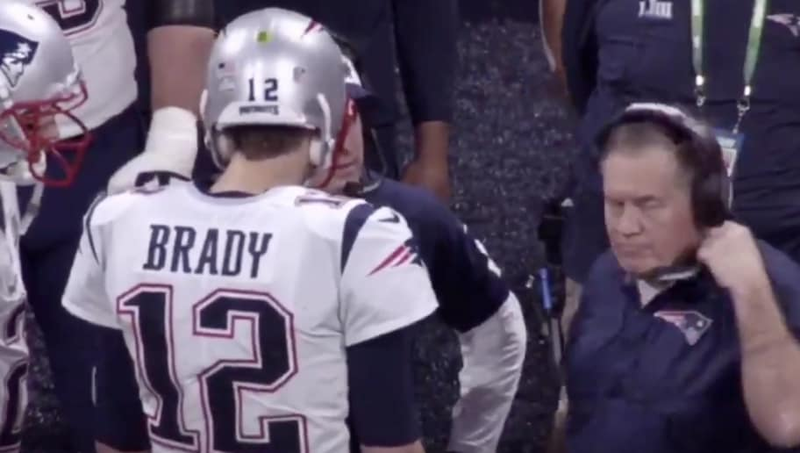 Belichick was able to trust in the advice of his 41-year-old quarterback and it ended up securing the team a victory on the biggest stage.